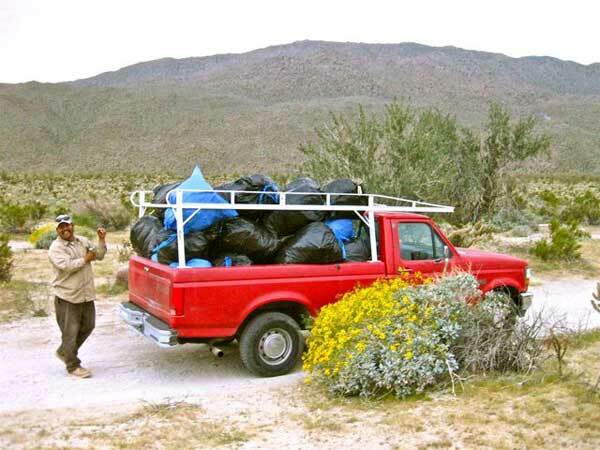 Robert L. Staehle pulling Sahara Mustard from the Anza Borrego Desert. 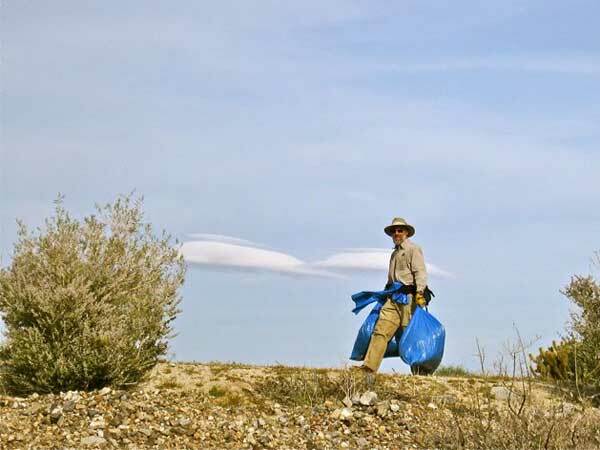 Produced by Tubb Canyon Desert Conservancy on Vimeo. Over several weekends in March and early April of 2011, Tubb Canyon landowners, with help from a small, but dedicated crew of hired workers and volunteer friends, cleared over 200 acres of Sahara mustard from Tubb Canyon Bajada on both private, protected land and within Anza-Borrego Desert State Park from Tubb Canyon eastward to Borrego Springs Road. This special project was reported in the Borrego Sun article, "Tub Canyon residents rally to fight mustard." Anza-Borrego Desert State Park does not have the budget to clear park boundaries and visitor destinations where Sahara Mustard invasion has been hastened by cars, especially off-road vehicles, bringing in Sahara Mustard seeds. The densest infestations of mustard are along paved and unpaved roadways, radiating out 100 yards from the side of roads. Next year, that zone of mustard will probably extend to 120 or 150 yards from disturbed soils along road sides... and grow faster and farther each year no one takes action.  Together, all of us who care about the desert can stop the mustard invasion, but only if everyone does their part... Right now, that is not happening. Many residents and visitors remain unaware of the mustard invasion. Many others are in denial regarding the threat posed by Sahara Mustard, or, they feel the situation is hopeless. As dire as the Sahara Mustard takeover has become, it is still stoppable if we act quickly! 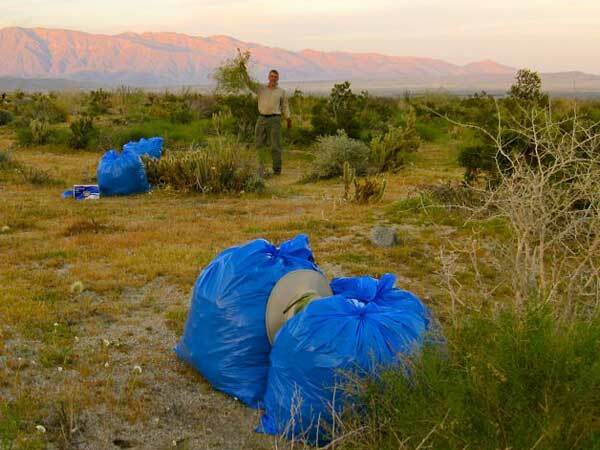 If a few landowners with a small crew of workers and friends can clear hundreds of acres of Sahara Mustard in a few weekends, than imagine what can be accomplished if Borrego Springs residents and visitors all dedicate themselves to pulling mustard next season! This is a call to arms for neighbors, students, civic clubs, local businesses, and visitors to join a "No Mustard Left Behind" campaign. 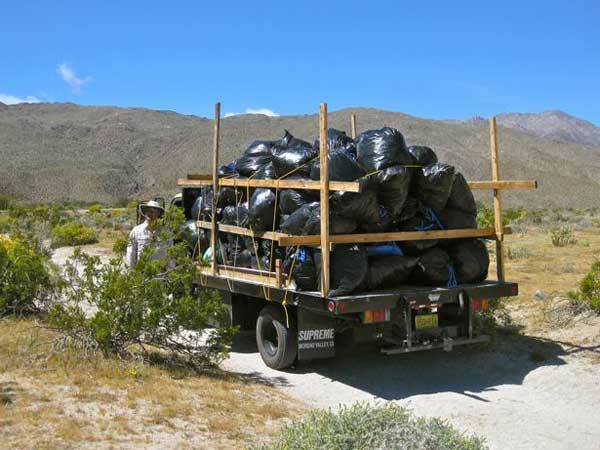 Local businesses can "adopt" stretches of road or an acre of wildflower fields and clear those areas with employee volunteers or by funding a crew. That's positive PR and will help protect the natural resources that bring business to town. No wildflowers or desert beauty... No visitors. Losing our desert to Sahara mustard is too awful to contemplate. 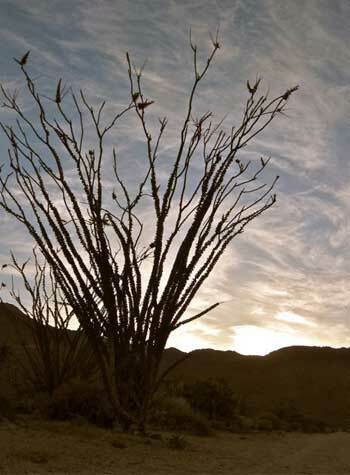 Gone forever would be the beauty and biodiversity of our Sonoran desert. Wildlife would die due to loss of habitat, and the resulting wasteland of dry Sahara Mustard would become a serious fire hazard that would threaten local homes and parkland. 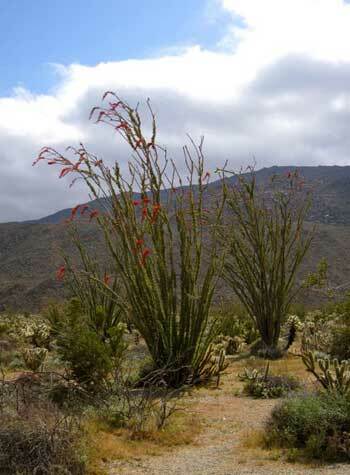 Borrego Springs may not survive if it loses income from tourists no longer visiting during wildflower season. 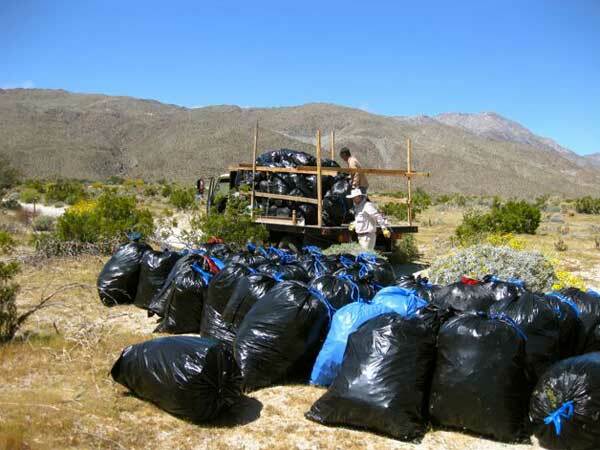 The success of the Tubb Canyon effort can be replicated, acre by acre, across Borrego Valley and into Anza-Borrego Desert State Park. We urge everyone who cares for the survival of the desert to step forward and become involved in eradicating Sahara Mustard wherever it is found. 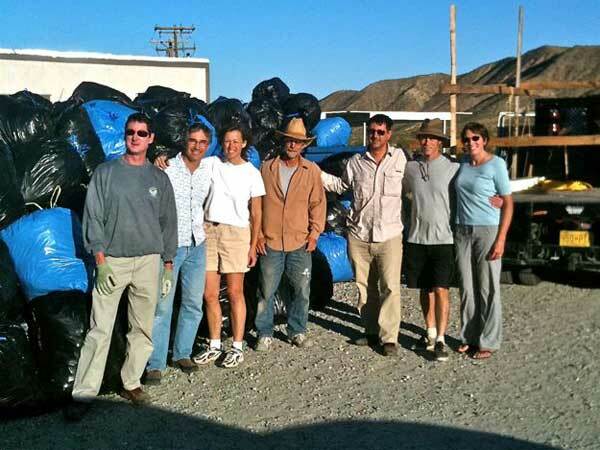 David Garmon, TCDC President, with a crew of "Tubb Canyon Mustard Busters" enjoying their box lunch break. 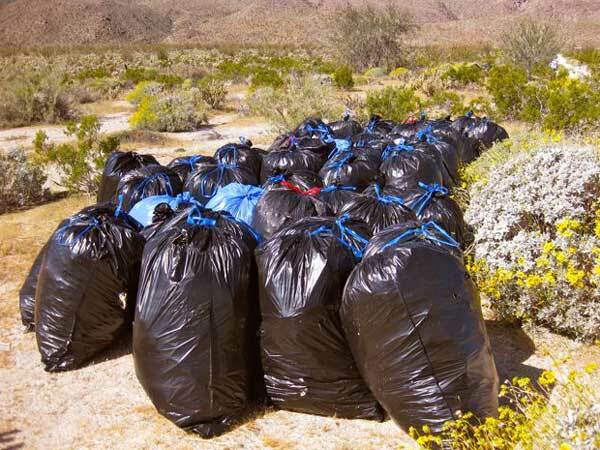 Lunches and snack bags were generously donated by a local Borrego Springs country club for those pulling mustard. 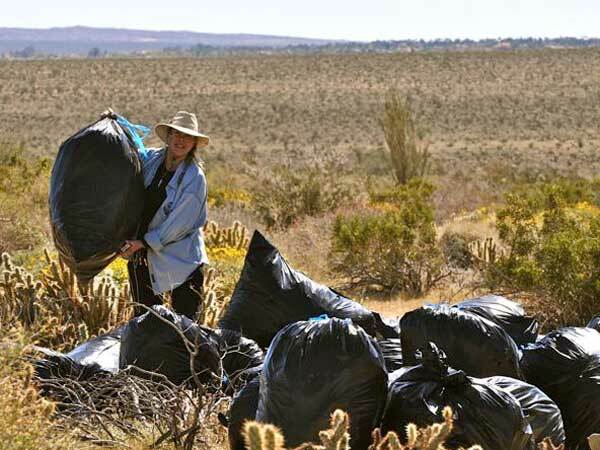 Robert Staehle, TCDC Vice President, collecting bags full of Sahara Mustard. 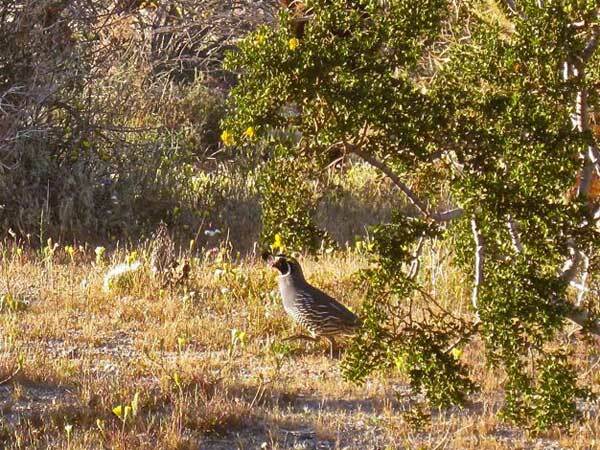 A male Gambel's Quail visited during mustard removal. 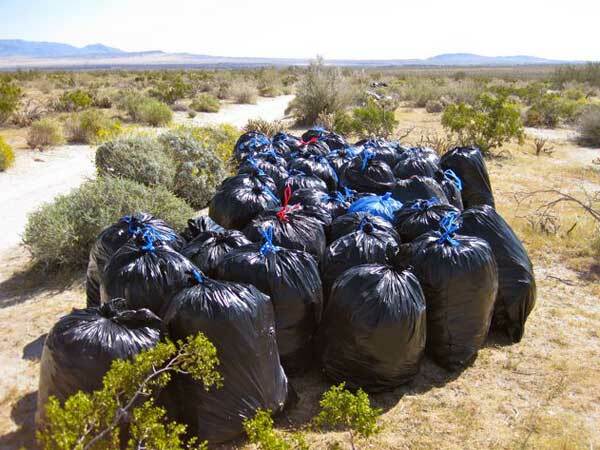 Bags of Sahara Mustard pulled from within Anza-Borrego State Park were staged along Tubb Canyon Road for pick up and disposal in the commercial dumpster at park headquarters. Neighbors brought their trucks and cars by to pick up bags full of Sahara Mustard for transport to the disposal site at park headquarters. 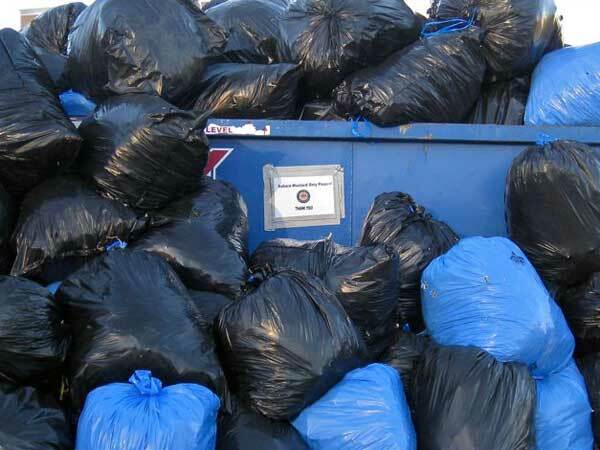 A full load on its way to the dumpster! 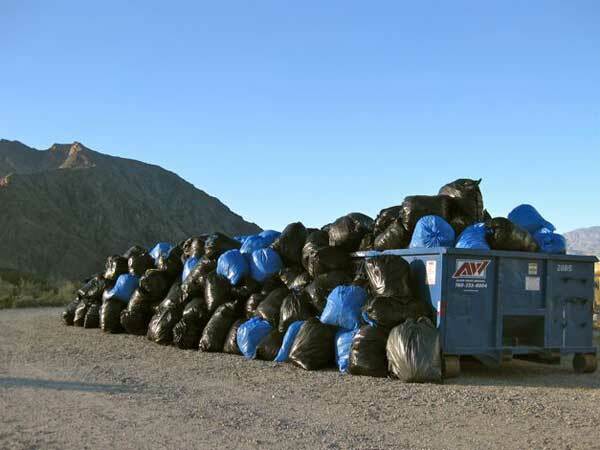 One weekend's worth of "mustard busting" from Tubb Canyon Bajada overflowed the commercial dumpster at Anza-Borrego State Park Headquarters. Anza-Borrego Desert State Park land south of Tubb Canyon Road (with the Pinyon Mountains in the background) after clearance of Sahara Mustard in March 2011. Sunset over the area cleared of Sahara Mustard. The following two pictures were taken on 26 March 2011 during the clearing of Sahara Mustard along Tubb Canyon Road. The left picture is the "before clearing" picture. The right picture is the "after clearing" picture. 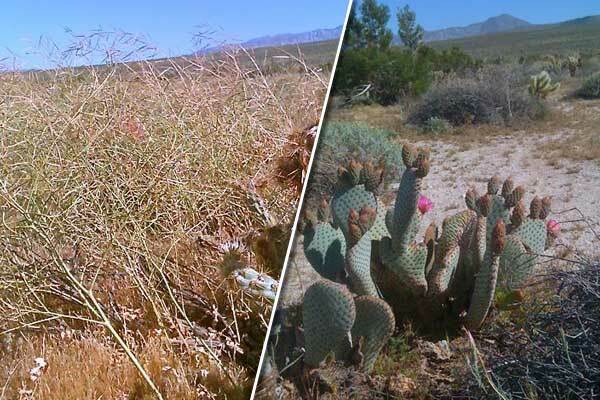 If we elect to do nothing, if we delay action for too long, I fear these pictures will be reversed: the "before" picture being the lovely cactus blossom, the "after" picture being the strangulation of wildflowers, shrubs and cacti by the invading horde of Sahara Mustard. Please do not let this happen! Join TCDC in our efforts to eradicate Sahara Mustard.